Photo: Mill Worker House No. 3, ca. 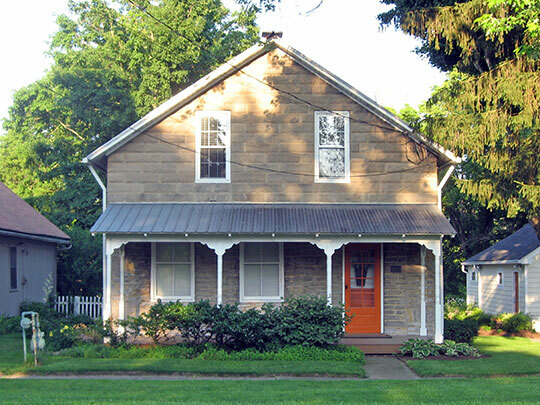 1851, 505 Stratford Road, Delaware Township, Delaware County, Ohio. Listed on the National Register of Historic Places in 1991. Photographed by User:Nyttend (own work), 2010, [cc0-by-1.0 (creativecommons.org/publicdomain/zero/1.0/deed.en], via Wikimedia Commons, accessed August, 2013. The Delaware County Courthouse is located at 101 North Sandusky Street, Delaware OH 43015; phone: 740-833-2100. Delaware County borders the City of Columbus (to the south) and during the first decade of the 21st century has been one of the fast-growing counties in the state. Delaware City, the County Seat, is home to Ohio Wesleyan University.